Since Star Wars™ Battlefront™ was revealed in April at Star Wars™ Celebration, many have been asking if there would be a Beta. Today, EA are thrilled to finally be able to answer that question, and the answer is yes! 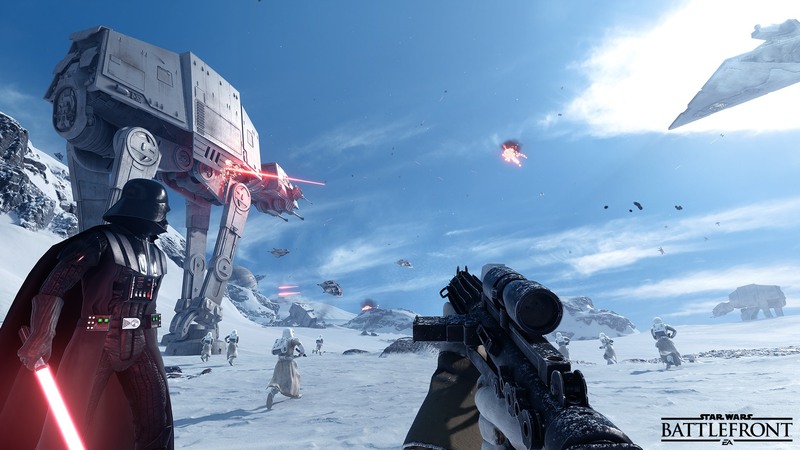 Coming early October to PlayStation 4, Xbox One, and on Origin for PC, the Star Wars Battlefront Beta is a technical test and will feature Walker Assault on Hoth and a 40-player multiplayer battle featuring Rebels and the Empire. Walker Assault will give you the chance to play as two of the most iconic characters in the Star Wars™ universe: Darth Vader and Luke Skywalker. The Beta will also feature a Survival Mission on Tatooine, where you and a Rebel friend must fight back waves of Imperial forces. In addition to those two modes, EA have announced a brand-new mode that will be available in the Beta, Drop Zone. More details on Drop Zone will be revealed in the weeks ahead. As part of the Star Wars Battlefront Beta the Star Wars Battlefront Companion experience app was announced. Available during the Beta at www.StarWarsBattlefront.com, the Star Wars Battlefront Companion experience features the strategic card game Base Command, and lets you earn in-game Credits that unlock Star Cards, weapons, and more in Star Wars Battlefront. In addition to Base Command, the Companion app also lets Rebels and Imperials alike check game stats and progression, customize load-outs and appearance, connect with friends, and get notified when they’re playing Star Wars Battlefront – as well as gather intel on their stats and progression so you can see how you match up! The Star Wars Battlefront Companion will be available on web and in the Apple App Store™ and Google Play™ store prior to the release of Star Wars Battlefront on November 17. More info regarding the Star Wars Battlefront Beta will be revealed in the weeks ahead. This entry was posted in 2, Developer, game, games, Games Developer, job, Jobs, mobile, starwars, train, train 2 game, Train2Game, www.train2game-news.co.uk and tagged 2, Battlefront, beta, Companion app, Darth Vader, developer, EA, game, Games Developer, games industry, Luke Skywalker, Star Wars, train, Train2Game by Train2Game Blogger Team. Bookmark the permalink.